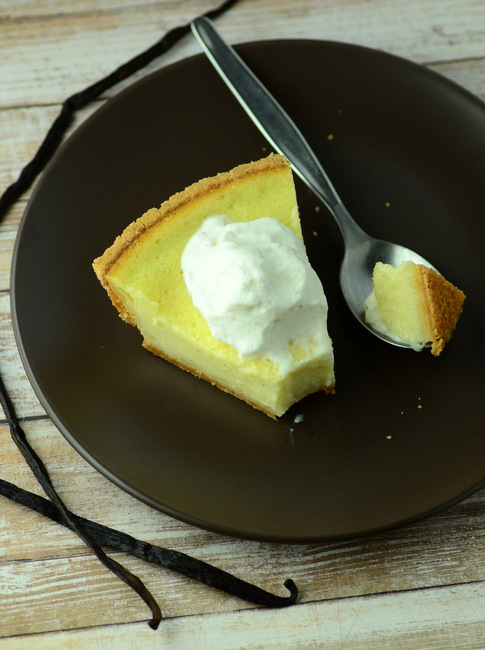 Buttermilk pie is a simple custard pie that is always a favorite with my family. 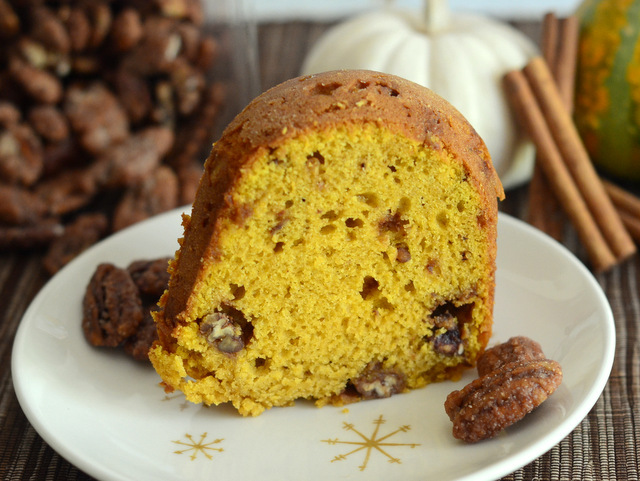 I always enjoy baking with buttermilk because it brings a lot of flavor into cakes, waffles and other bakes. This pie filling is no exception, as the buttery and tangy flavor of the buttermilk makes for a pie filling that is reminiscent of cheesecake – but much, much lighter. 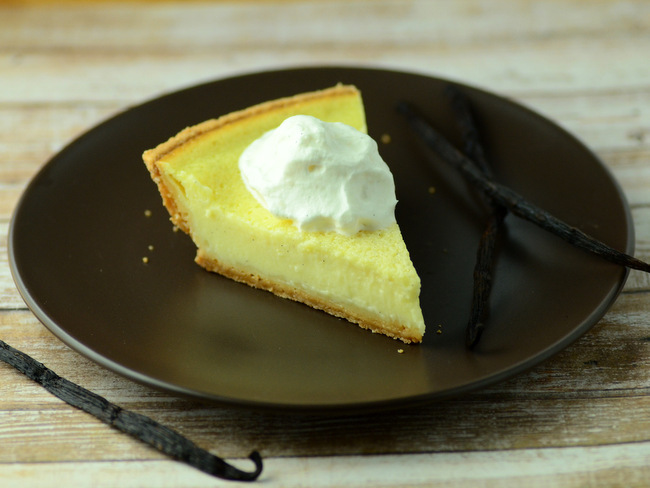 This Vanilla Bean Buttermilk Pie is an easy version of this classic pie, where buttermilk is accented with a touch of sweetness and lots of flavor from real vanilla beans. There are only a handful of ingredients in the filling. It is made with buttermilk, eggs and sugar, along with a bit of cornstarch to give it a texture that allows you to slice it easily after baking. I used real vanilla bean and it is worth splurging on in this recipe. The aromatic sweetness of the vanilla really comes through in the finished pie and it balances perfectly with the flavor of the buttermilk. The custard is tender and light, with a nice creaminess that contrasts well with the crisp crust. The pie may be simple, but it is downright addictive once you start to eat it. I used a shortbread crust for this recipe and like how the butter and vanilla of the crust compliment the filling. A pastry crust can also be used, but I would recommend blind baking it before adding the filling to ensure that it has enough time in the oven to bake through completely. Graham cracker crusts can be used, however they have a slightly stronger flavor (even though it is delicious!) that will compete a bit with the delicate flavors of the filling, so it isn’t my first choice for this particular pie. This pie is best when it has had a few hours to chill after baking, which ensures that the filling is completely set and will slice neatly. Serve it on its own, top it with a handful of berries or throw on a dollop of lightly sweetened whipped cream. If you do opt for the whipped cream, make sure you add a splash of vanilla or a small amount of vanilla bean to it to add even more vanilla to the dessert as a whole! In a large bowl, whisk together sugar, cornstarch and salt until well-combined. Add in eggs and whisk until smooth. Split the vanilla bean lengthwise down the middle and use the back of a knife to scrape the seeds from the center of the pod. Add seeds to egg mixture, then add in buttermilk and whisk until smooth. Pour into prepared crust. Bake for 10 minutes at 400F, then turn the oven temperature down to 350F (without opening the door) and bake for an additional 30-35 minutes, or until just set. Allow pie to cool completely on a wire rack, then refrigerate until ready to serve. Makes 1 pie; serves 8-10. This pie looks so delicious! I never had buttermilk pie before -can’t wait to try this recipe.